TEMPE, Ariz. – Flow Technology, Inc. (FTI), a leading manufacturer of precision flow measurement instruments, systems and calibrators, today announced the availability of the DC-F Series Positive Displacement (PD) flow meter for use in bakery and snack food applications. With only two moving parts and a unique bearingless design, this PD meter offers “bullet-proof” performance and a low total cost of ownership. Available in 1/8 in. to 2 in. lines sizes, the DC-F Series sanitary flow meter provides accurate flow measurements in food industry applications where batch repeatability is desired. Common liquids measured include: water, corn syrup, liquid sugar, egg yolks, edible oils, caramel, honey, cream yeast and other fluids used in bakery processes. The DC-F Series meter utilizes two patented impellers (gears) to measure precise volumes of liquid passing through the meter as the gears rotate. Traditional PD meters have many parts, making maintenance difficult and costly. In addition, the DC-F Series is Clean-in-Place (CIP) compatible without disassembly. 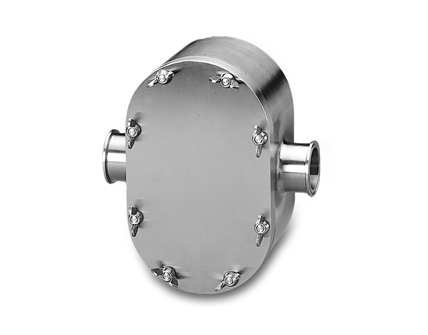 Unlike Coriolis flow meters, which are frequently used in food & beverage applications, the compact DC-F Series is easy to install, commission and operate—reducing costs over the life of the meter. It is also impervious to entrained gas, which is a common problem with even modern Coriolis designs. Additionally, the DC-F Series provides high turndown, ensuring users do not have to give up future production increases. The EO Electro-Optic Encoder enables accurate monitoring of high viscosity fluids traveling at a low flow rate, or being batched in very small quantities. Unlike a magnetic pickoff, this equipment delivers a high-resolution output that can be as high as 630,000 pulses per gallon (166.45 pulses /cc). For more information about the HP/EP system, please visit https://ftimeters.com.